The Miami HEAT face the Oklahoma City Thunder Monday night at Chesapeake Energy Arena. Tip-off is set for 8:00 PM, and television coverage is on FOX Sports Sun. You can also listen to the action live on 790 The Ticket. 1: How were the HEAT able to pull away from the Hornets in Sunday’s significant victory? Couper Moorhead: The final period was all about shooting, as the HEAT hit six threes to Charlotte’s zero and won by that exact margin: 18. But the reason that final stretch came down to shooting was because both teams were playing a fair bit of zone throughout what wasn’t exactly the prettiest game you’ll ever lay eyes on. Charlotte was doing its best to keep the HEAT out of the paint, so it’s no surprise their offense didn’t really get any traction until they started to hit some shots. On the other end, the HEAT’s plan was very clearly to make sure Kemba Walker didn’t beat them as they threw traps and a top-heavy zone at him until he gave the ball up. When the Hornets moved the ball well enough in those advantage situations they got some decent opportunities from deep, but they didn’t have anyone who could make consistent plays. Walker wound up shooting 4-of-16 as he essentially had to force the issue just to get a shot up, and secondary playmakers Nic Batum and Jeremy Lamb combined for 11-of-31 shooting. If the HEAT had a possible playoff series against the Hornets looming, which they don’t, the most dominant storyline going into it would be how Charlotte could try to counter such a specific anti-Walker scheme. Joe Beguiristain: As was the case in the prior meeting between the two on March 6, it was all about stopping Kemba Walker. And once again, the HEAT made life miserable for the 28-year-old point guard and held him to well below his scoring average. 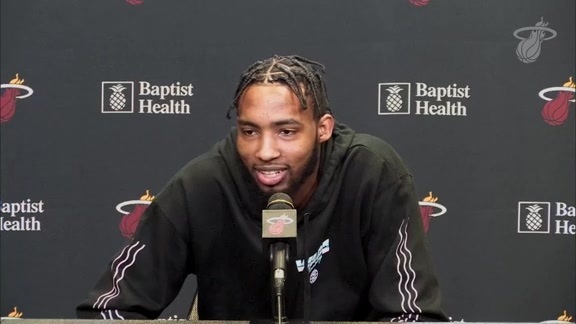 Thanks to great individual defense by Derrick Jones Jr. and Josh Richardson and timely trapping by Bam Adebayo and Hassan Whiteside, Walker scored just 10 points on 4-of-16 shooting. Then on the flip side of the ball, Dwyane Wade did Dwyane Wade things with 12 points in the fourth, including a three with 4:44 left that basically sealed it, while Goran Dragić chipped in 10 of his game-high 19 in the final period thanks to a bevy of shots from outside the paint. Above all else, though, it was good to see Miami take care of business in a very important game before heading out on a rather difficult road trip. 2: What happened the last time Miami faced Oklahoma City? Couper: Paul George and Dennis Schröder happened. The Thunder were, as expected, a difficult team to score against given all their size and length, but with George shooting 10-of-16 and Schröder, not usually the most efficient player, shooting 11-of-13 and 4-of-6 from three, the Thunder got out to an early 20-point lead and never looked back. There really wasn’t much more to it than that. It was a dominant performance, and a game the HEAT probably didn’t want to dwell on for too long. It will still be a challenge finding points, especially on the tail end of a back-to-back with a fairly long flight in between, but Miami has a good chance of inducing more misses from that pair, thanks to sheer regression and some better closeouts. Joe: As Coup mentioned above, Paul George and Dennis Schröder balled out and helped Oklahoma City take a 19-point lead into the break. In particular, Schröder went crazy in the second quarter with 24 points on a perfect 9-of-9 shooting. Yes, 24 points. From there, the Thunder maintained their lead and cruised to a 16-point victory. And while the HEAT’s defense certainly could have been better, their offense also struggled to score consistently. Then again, a lot of teams have had that issue against OKC, as the Thunder are ranked fourth in defensive rating (105.6) and first in points off turnovers (19.7). 3: How will this game be different with Russell Westbrook out? Couper: While Schröder did much of the scoring damage at the point position, Westbrook still had 14 assists in that last meeting, with a number of those coming from threes he created for George. Schröder is as capable a backup as there is in this league, and Raymond Felton is a solid option behind him, but neither bends the defense nearly as much as Westbrook can when he’s going full force. That means George’s looks probably won’t be as clean and the HEAT will be able to make him work much harder to find opportunities, perhaps even using some zone and/or traps to keep the ball out of his hands. 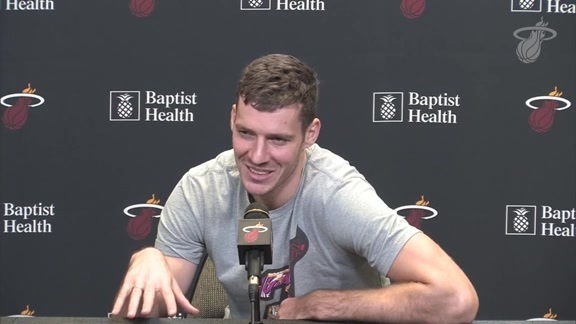 Joe: Well, making up for a guy who averages a triple-double is no easy feat. Seriously, though, Westbrook’s ability to create for others and score with ease in transition after forcing turnovers will be sorely missed. All told, Oklahoma City is 11.5 points per 100 possessions worse when Westbrook is off the court. That’s crazy. As such, the onus will be on George, who has averaged 30.0 points, 9.3 rebounds and 3.3 assists per game over his past three, to shoulder the scoring load. The HEAT fell to the Thunder 118-102 in their last meeting on Feb. 1. Miami has won seven of ten and is 33-36, while Oklahoma City has dropped three of five and enters the contest at 42-28. Dwyane Wade has scored 649 points against the Thunder during the regular season in his career. Paul George leads Oklahoma City in points (28.3) and steals (2.2) per game. Rodney McGruder (Left Knee Soreness) and Justise Winslow (Right Thigh Bruise) are out, while Dwyane Wade (Right Hip Bruise) is probable.